This article is about the television series. For other uses, see Green Acres (disambiguation). Receiving solid ratings during its six-year run, Green Acres was cancelled in 1971 as part of the "rural purge" by CBS. The sitcom has been in syndication and is available on DVD and VHS releases. In 1997 the two-part episode "A Star Named Arnold is Born" was ranked #59 on TV Guide's 100 Greatest Episodes of All Time. Following the success of The Beverly Hillbillies and Petticoat Junction, CBS offered producer Paul Henning another half-hour on the schedule—with no pilot required (which was very unusual). Henning encouraged colleague Jay Sommers to create a series for the time slot. Sommers created the show based on his 1950 radio series Granby's Green Acres. The radio series, which lasted 13 episodes, had starred Gale Gordon and Bea Benaderet as a big-city family who moved to the country. In pre-production, proposed titles were Country Cousins and The Eddie Albert Show. 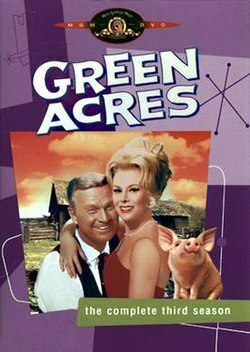 Green Acres is about Oliver Wendell Douglas (Eddie Albert), an erudite New York City attorney, fulfilling his dream to be a farmer, and Lisa Douglas (Eva Gabor), his glamorous Hungarian wife, who is dragged unwillingly from an upscale Manhattan penthouse apartment and the city life she adores to a ramshackle farm. The theme tune, as with those of the show's rural cousins, explains the basic premise of the show. At the end of the opening sequence, Albert and Gabor strike a pose in parody of Grant Wood's 1930 painting American Gothic. The debut episode is a mockumentary about their decision to move to a rural area, anchored by former ABC newscaster John Charles Daly. Daly was the host of the CBS game show What's My Line, and a few weeks after the show's debut Albert and Gabor returned the favor by appearing on What's My Line as that episode's Mystery Guests, and publicly thanked Daly for helping to launch their series. After the first episodes, the series developed an absurdist world. Though many episodes were still standard 1960s sitcom fare, the show became notable for its surrealism and satire. Characters frequently broke the fourth wall to address the audience, and on several occasions Lisa was seen apparently reading the superimposed episode credits (which she called 'the written-bys') although they were invisible to Oliver. The writers soon developed a trademark suite of running jokes and visual gags that recurred throughout the series – Lisa's inedible "hotscakes" and treacle-like coffee, Oliver's constantly exploding Hoyt-Clagwell tractor, the regular annoying visits by local con-man Mr Haney, Eb's irritating habit of addressing Oliver as "Dad", Oliver doing all the farming in a three-piece suit, the perennial inability of local handymen the Monroe Brothers (one of whom was a woman) to complete any work on the house, Oliver and Lisa's ongoing battle with the phone company and their struggles with the precarious electricity and water supplies, and the town's apparent ability to overhear everything that happens in the Douglas house. The show appealed to children through its slapstick, silliness and shtick, but adults were able to appreciate it on a different level. A typical scenario had Lisa answering the telephone and taking down a message to the effect that people wanted Oliver to be a judge of the "Apple Court". Oliver naturally assumes that she has misunderstood and that Oliver was being offered a seat on the Appeal Court of the state. The denouement comes when, on visiting the County Fair, Oliver is announced as being the one who would judge the best basket of apples entered. The show is set in the same universe as Henning's other rural television comedy, Petticoat Junction, featuring such picturesque towns as Hooterville, Pixley, Crabwell Corners and Stankwell Falls. At times it shares some of the popular characters from Petticoat Junction, including Joe Carson, Fred and Doris Ziffel, Sam Drucker, Newt Kiley, and Floyd Smoot. Much of the humor derives from the Quixotic yet short-fused Oliver, who strives to make sense of his oddball surroundings. There seems to be a dual perspective of reality: Oliver versus everyone else. The latter encompasses the Hootervillians, Oliver's high-maintenance wife Lisa and his affluent mother (Eleanor Audley), who lampoons him for his agricultural pipe-dreams. Such dual realism is at its best when everyone but Oliver can see the TV screen credits, when he corrects Lisa's mangled mispronunciations only to find that he is the only one in town with the correct usage, and when all but Oliver can translate Arnold the pig's grunts and snorts into English. Among Oliver's ongoing irritants are his makeshift, low-output electric power system; his outdoor telephone, which was installed atop a pole; and the Monroe brothers' countless botched remodeling projects (bedroom track doors, outdoor shower stall, unattached doorknobs, weak floorboards, etc. ), which are rarely, if ever, completed. Conversely, Oliver himself is subject to ribbing by the townsfolk when he performs farming chores dressed in a three-piece suit and when he launches into starry-eyed monologues about "the American farmer"—replete with a fife playing "Yankee Doodle" in the background (as an example of the series occasionally breaking the fourth wall, every on-screen character except Oliver can hear the fife playing). The contrast of Oliver versus the townsfolk is further emphasized by the brand-new Lincoln Continental convertible that he drives, in contrast to the ancient, derelict truck driven by Mr. Haney. Lisa's skewed world view and domestic ignorance provides fertile ground for recurring gags. Much of her early life was lived in Hungary, where she grew up pampered in a wealthy family, which explains her lack of education and her ignorance of normal household chores and everyday living. Oliver and she are both veterans of World War II; he, a United States Army Air Forces flier, and she, a member of the Hungarian underground. Her waterless "coffee" oozes from the pot in a thick tar-like sludge. Her "hotcakes" (pronounced "hotscakes") are inedible, so tough that Oliver makes head gaskets for his truck and tractor using the recipe. In one episode, hotcake batter is used as fireplace mortar; in another, hotcakes are used to reshingle a roof. Her sandwiches include such epicurean delights as liverwurst and jelly. Instead of washing dishes, Lisa sometimes tosses them out the kitchen window (a gag also used by Phyllis Diller in The Pruitts of Southampton). In one episode Oliver finds Lisa mending holes in his socks with a stapler. As he begins to comment on it, a visiting Fred Ziffel says, "I see you're mending socks! Darned if you don't do it better than Doris does!" In the episode "Alf and Ralph Break Up", Lisa admits that she has no cooking abilities and says her only talent is her Zsa Zsa Gabor imitation (the real-life sisters were often mistaken for one another). Oliver and Lisa are both depicted as fish out of water; however, the concept provides an ironic twist. While Oliver instigated the move from Manhattan to Hooterville over Lisa's objections, Lisa more naturally fits into the illogic of their neighbors while quickly assimilating to their quirky, offbeat surroundings. Oliver, while eager to fit in, is often at a loss to grasp the surreal Hootervillians. Mr. Haney (Pat Buttram) is the oily, dishonest local salesman who originally sold Oliver the Green Acres Farm (previously the Old Haney Place). In the early episodes Haney repeatedly profiteers from Oliver by removing all the farm's basic fittings and equipment (the kitchen sink, bath, stove, cow, tractor, plough, etc), and selling or renting them back to Oliver at wildly inflated prices. In succeeding episodes Haney invariably arrives on cue every time Oliver needs an item or service, typically accompanied by a custom-made sign for each occasion. Pat Buttram later revealed that Haney's character was inspired by Elvis Presley manager Col. Tom Parker. Eb Dawson (Tom Lester) is the naive, wide-eyed, yet smart-mouthed young farmhand to the Douglases. He habitually addresses the Douglases as "Dad" and "Mom", much to Oliver's consternation. Fred Ziffel (Hank Patterson) and his wife Doris (Barbara Pepper 1965–1968, Fran Ryan 1969–1971) are the Douglases' childless elderly neighbors. They have a pig named Arnold, whom they treat as their "son". Fred is a cantankerous old-fashioned farmer who was born during the Grover Cleveland administration. Everything about him is "no-nonsense", except for the fact that his "son" is a pig. Arnold Ziffel is a pig whom the Ziffels treat as a son, understands English, lives indoors, and is pampered. Everyone understands Arnold when he grunts, as if he were speaking English, except Oliver. He is an avid TV watcher and a Western fan, attends the local grade school (carrying his book pack in his mouth), and signs his own name on paper. Only Oliver seems cognizant that Arnold is just livestock, although he frequently slips and begins treating him as a boy. Arnold makes regular appearances throughout the series, often visiting the Douglas home to watch their TV. Alf (Sid Melton) and his "brother" Ralph (Mary Grace Canfield) are two quarrelsome carpenters. In the episode that introduces them, Alf confesses that Ralph is actually his sister, and explains they would not get jobs if people knew that she is a woman. The Monroes rarely finish projects, and those that they do complete are disasters, such as the Douglases' bedroom closet's sliding door that is always falling down, their unsuccessful attempts to secure the doorknob to the front door, etc. In one episode, after accidentally sawing Sam Drucker's telephone line at the general store, they splice it back together, although backwards, causing Drucker to listen at the mouthpiece and talk into the receiver. Melton left in 1970 (season four) to do Make Room For Granddaddy, so the writers developed an occasional subplot that involved sister Ralph's attempts to win the affections of "Hanky" Kimball or some other hapless Hooterville bachelor. Alf later returns for Ralph's failed wedding to Kimball. Sam Drucker (Frank Cady) is a regular character in both Petticoat Junction and Green Acres. The first bar of the Petticoat Junction theme song is usually played during the establishing shot of his store, which also appears on Petticoat Junction, indicating that Petticoat Junction's Shady Rest Hotel is very close to Hooterville. While Drucker is a provincial everyman in Petticoat Junction, his character is a bit bent on Green Acres. He keeps plastic pickles in a barrel to appease "city folk". He is backward as well: his candlestick telephone dates from the 1920s. Drucker also serves as a newspaper editor and printer, volunteer fireman with the Hooterville Volunteer Fire Department, constable, justice of the peace, and postmaster. As editor of the Hooterville World Guardian, his headlines are often decades old. He is slow as postmaster, having belatedly delivered a lost 1917 "draft" notice to Fred Ziffel after 51 years, which surpassed the 26-year delivery record of a lost 1942 WPA letter to Haney for stealing a shovel. As justice of the peace, Drucker once let his license lapse, unwittingly sending Ralph Monroe and Kimball to their premature honeymoon. Drucker is often the only character who is inspired by Oliver's rural patriotism. He filters Oliver's idealism to the townsfolk and, conversely, filters the plebeian backwoods notions of the community back to Oliver. In one episode (season 5, episode 21, "The Case of the Hooterville Refund Fraud"), the menfolk believe that they can get a tax refund without ever having paid taxes. To Oliver's surprise, they do. The Internal Revenue Service threatens to send everyone to jail but then settles for becoming business partners with the farmers in one of Mr. Haney's many outlandish schemes (a monkey-racing track, named in honor of Mr. Douglas) to recoup their money. A gentle parody of regional government bureaucrats and civil service employees, Alvy Moore plays spacey county agricultural agent Hank Kimball, who draws folks into inane conversations, loses his train of thought, then exits the scene. The series was reportedly one of the first pre-recorded sitcoms to use cue cards extensively during filming, and Moore later recounted that he found them invaluable when performing Kimball's convoluted rambling, rapid-fire dialogue. Shady Rest Hotel owner Kate Bradley appears in a few early episodes. She tries to help Lisa adapt to country living, most notably giving her the recipe for her hotcakes, which Lisa ends up botching, resulting in Lisa's infamous "hotscakes". Uncle Joe Carson (who soon develops a romantic interest in Oliver's mother) is seen at times playing checkers, loafing or mooching fruit at Drucker's Store with Petticoat Junction regulars Newt Kiley and train conductor Floyd Smoot. Betty Jo Bradley appears in one episode as Eb Dawson's date. Her sister Bobbie Jo appears in the same episode. Blonde-haired Billie Jo is the only Bradley sister never to appear in Green Acres. Western film actor Smiley Burnette guest-stars several times as railway engineer Charley Pratt in 1965 and 1966. Burnette and Pat Buttram (Mr. Haney) were both comic sidekicks of singing cowboy Gene Autry in his '50s Westerns. In the March 1967 episode "The Beverly Hillbillies" (season 2, episode 23), the Hooterville theater puts on a play in homage to "famous television show" The Beverly Hillbillies. Oliver plays Jethro opposite Lisa as Granny Clampett. This treats their sister show as a fictional entity. However, starting in 1968, The Beverly Hillbillies produced a string of episodes with the Clampetts in Hooterville visiting distant cousins the Bradley family. This brought the world of all three shows into the same reality. "The Thanksgiving Story" includes a split-second insert of Eddie Albert and Eva Gabor at the dinner table with the casts of all three series. There is a sub-plot with Eb Dawson falling in love with Elly May Clampett that continues in the following episode "The Courtship of Homer Noodleman". The Clampetts return to the Shady Rest Hotel in "Christmas in Hooterville" with Eb still fawning over a reluctant Elly May. The Sam Drucker character appeared in 10 episodes of The Beverly Hillbillies, including a solo visit to the Clampett's Beverly Hills mansion in "Sam Drucker's Visit." Several of these stories involve Granny taking a romantic interest in Sam and misunderstanding his intentions. In 1970–1971, during the series' sixth season, Green Acres placed 34th out of 96 shows. Despite the respectable ratings and winning its timeslot, the show was cancelled in the spring of 1971 after 170 episodes. CBS at the time was under mounting pressure from sponsors to have more urban-themed programs on its schedule. To make room for the newer shows, nearly all of the rural-themed shows were cancelled. This part of television history has become known as the "rural purge". Pat Buttram said of the purge, "CBS cancelled everything with a tree – including Lassie." There was no series finale. The final two episodes of Green Acres were backdoor pilots for Pam and Carol, a couple of shows that were never picked up by a network. In the 1990 reunion TV movie Return to Green Acres, made and set two decades after the series, Oliver and Lisa have moved back to New York but are miserable there. The Hootervillians implore the couple to return and save the town from a scheme to destroy it, cooked up between Mr. Haney and a wealthy, underhanded developer (Henry Gibson). The Monroe brothers still have not finished the Douglases' bedroom, while a 20-something Arnold survived his "parents" and subsequently bunks with his "cousin", the Ziffels' comely niece. With a nod to the times, Haney's latest product is a Russian miracle fertilizer called "Gorby Grow". During its six-season run, many familiar actors guest-starred on the show, along with other lesser-known performers who later achieved stardom, among them: John Daly, Elaine Joyce, Gary Dubin, Herbert Anderson, June Foray, Bob Cummings, Sam Edwards, Jerry Van Dyke, J. Pat O'Malley, Johnny Whitaker, Jesse White, Al Lewis, Gordon Jump, Bernie Kopell, Len Lesser, Bob Hastings, Don Keefer, Don Porter, Alan Hale, Melody Patterson, Rusty Hamer, Regis Toomey, Heather North, Allan Melvin, Parley Baer, Jack Bannon, Reginald Gardiner and Rick Lenz. Al Molinaro and Pat Morita guest-starred on separate episodes, while Rich Little made a cameo appearance as himself. The surviving members of the cast (except for Eleanor Audley, who had retired from acting 20 years earlier) were reunited for a TV movie titled Return to Green Acres. It aired on CBS on May 18, 1990. Eddie Albert and Eva Gabor recreated their Green Acres characters for the 1993 CBS special The Legend of the Beverly Hillbillies. On November 19, 2007, original series director Richard L. Bare announced that he was working on a revival of Green Acres. Variety announced on July 22, 2012, that a Broadway-aimed musical was in development, with an initial draft of the book written by Bare. No composer, lyricist, or director was attached. MGM Home Entertainment released the first three seasons of Green Acres on Region 1 DVD. The entire six-season run of the series is available for purchase via Amazon's video-on-demand service and is included in Hulu Plus subscriptions. On July 7, 2017, it was announced that Shout! Factory had acquired the rights to the series. They subsequently released Green Acres – The Complete Series on DVD in Region 1 on October 17, 2017. Season 4 was released on November 28, 2017. Season 5 was released on February 27, 2018. Season 6 was released on July 10, 2018. See main article, Granby's Green Acres. The Granby's Green Acres radio show aired from July 3 to August 21, 1950. The show was produced, directed, and written by Jay Sommers, who wrote and produced a third of the Green Acres episodes. In both, a businessman knowing little about farming moves to an impoverished farm. The characters are more conventionally odd, the wife stereotypically talkative and dim, the Sam Drucker character of Sam Drucker is the absent-minded and befuddled feed store owner Mr. Kimball while hired hand Eb (Parley Baer, who guest-starred in several episodes of the television series) is elderly and stoic about incompetent management. Until his death in March 2015, Bare was working on a film version of the TV series, and he was teaming up with Phillip Goldfine and his Hollywood Media Bridge to produce it. A Broadway version was also in development. In 1984, the USC School of Cinematic Arts gave a retrospective of Green Acres to honor Sommers. Cox, Stephen (1993). The Hooterville Handbook : A Viewer's Guide to Green Acres. St. Martin's Griffin. ISBN 0-312-08811-6. ^ "The 100 Greatest TV Episodes of All Time". members.aol.com. Archived from the original on 2007-10-28. ^ a b "Granby's Green Acres (6 Episodes)". Audio Archive > Radio Programs > Old Time Radio. Internet Archive. Retrieved 2012-08-03. ^ a b c "The amiable madness of Green Acres". ^ Neibaur, James L. (2014). The Elvis Movies. Rowman & Littlefield. p. 157. ISBN 9781442230743. ^ a b c "Green Acres Episode Guide". ^ "Green Acres – Season 5, Episode 21: The Case of the Hooterville Refund Fraud – TV.com". TV.com. CBS Interactive. ^ a b "Granby's Green Acres". ^ Ken Berry—Enjoys Taking Astaire Way to Mayberry and Beyond!, attributing quote to Pat Buttram], at KenBerry.com. Accessed March 23, 2009. ^ Cox, Gordon (July 22, 2012). "'Green Acres' heading to stage". Variety. Retrieved July 23, 2012. ^ "Green Acres DVD news: Announcement for The Complete Series – TVShowsOnDVD.com". www.tvshowsondvd.com. Archived from the original on 2017-07-09. ^ "Green Acres DVD news: Release Date for The Complete 4th Season – TVShowsOnDVD.com". www.tvshowsondvd.com. Archived from the original on 2017-08-12. ^ "Green Acres DVD news: Announcement for The Complete 5th Season – TVShowsOnDVD.com". www.tvshowsondvd.com. Archived from the original on 2017-11-09. ^ "Green Acres - 'The Complete 6th and Final Season' is Scheduled for Summer by Shout! Factory. 4-DVD set with all 26 episodes is sprouting in stores this July – TVShowsOnDVD.com". www.tvshowsondvd.com. ^ "'Green Acres' Moving From Hooterville To Hollywood: Feature Film, Broadway Play In The Works". Deadline. May 2, 2014. Retrieved 2014-05-02. ^ Folkart, Burt A. (September 28, 1985). "'Lum and Abner,' 'Green Acres' Among Credits : Jay Sommers, Prolific Writer for Radio, TV Shows, Dies at 68". Los Angeles Times. Retrieved 12 July 2015. This page is based on the Wikipedia article Green Acres; it is used under the Creative Commons Attribution-ShareAlike 3.0 Unported License (CC-BY-SA). You may redistribute it, verbatim or modified, providing that you comply with the terms of the CC-BY-SA.